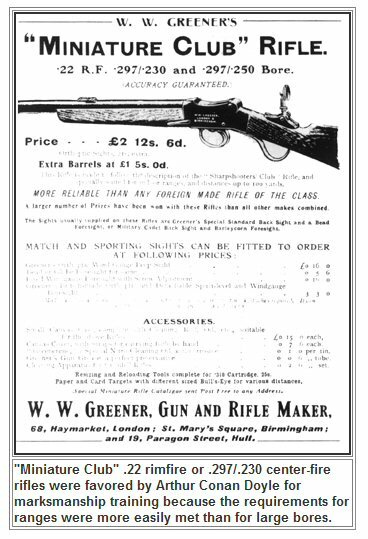 Probably the most significant competition for the Birmingham Small Arms Company's Martini Target Rifles, W.W. Greener built a reputation second to none with his conversions of the Martini Henry and Martini Metford/Enfield service rifles to small-bore target and training rifles. He often utilised actions from other manufacturers, particularly BSA full-bore and small frame Cadet, and built his own rifles around them. He also led the field with his own miniature calibre "take-down" designs. Few gunmakers could produce a truly reliable and accurate take-down target rifle; his own system, in which the action body was split below the barrel and clamped onto the barrel breech thread, became well respected and commonplace. The catalogue, from which replications are here shown, is undated; however, it holds mention of Greener's newly published edition of his book " Sharpshooting for War and Defence" of which the 'emergency edition' was dated October 1914. It appears that, with war imminent, W.W. had updated and renamed his earlier editions, first published in1900, and then entitled " Sharpshooting for Sport and War". It was apparent that sport shooting was no longer a priority other than for putting food on the table. We therefore believe the catalogue to be just prior to the Great War. The endorsement (above right) by Sir Arthur Conan Doyle - creator of that famous fictional detective pair, Sherlock Holmes and Dr. Watson, is perhaps an indication of early sponsorship; although it is far less likely that money changed hands - just a finely finished rifle as recognition of unsolicited recommendation would most likely have been the order of the day? William Greener produced a comprehensive range of target and sporting rifles ( 'Rook and Rabbit' particularly), both in full and small-bore. The target rifle range comprised of the famous "Miniature Club" and " Sharpshooter's Club" rifles, plus Ladies and de-luxe models - all on the 'small' actions. For many years, he also marketed the full-bore conversions to, mostly, .22 Rim-fire. He supplied, as did the well-known gunmakers C.G. Bonehill, converted Martini service rifles to the Society of Miniature Rifle Clubs and the National Rifle Association. 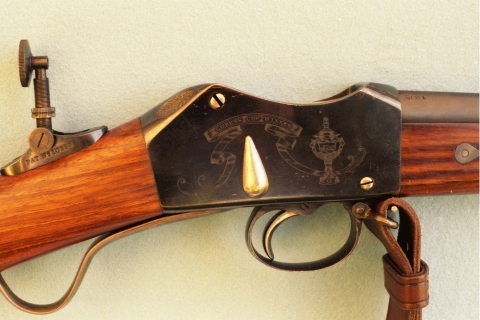 His most prestigious models of these, often offered as prize rifles in major competition, were the "King's Cup Winner" and "Queen's Cup Winner" rifles engraved such with elegant scrolls on the sides of the action body and of fine grade finish. 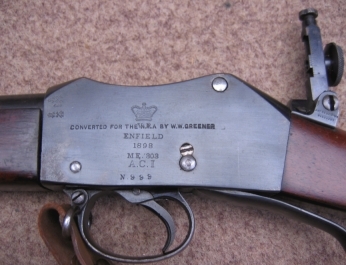 Greener additionally built up fine quality models of the BSA Martini Cadet rifles, usually of .310" centre-fire calibre, but also in .22RF, .297..230" and even .300" calibre, as well as miniature calibre conversions of the various Lee-Enfield Magazine Service rifles both Short and Long. Top-of-the-range Martini's were built, using all new components, most especially as TARGET RIFLES . Top: .22RF - The Miniature Ammunition Manufacturing Co. of Pall Mall, Olympic Model Serial No. 02326V. 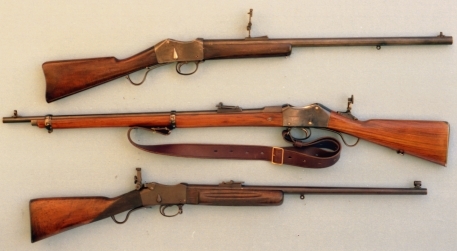 These rifles were made for the M.A.M.Co., by W.W. Greener and are listed in E.H. Robinson's book "Rifle & Carton". 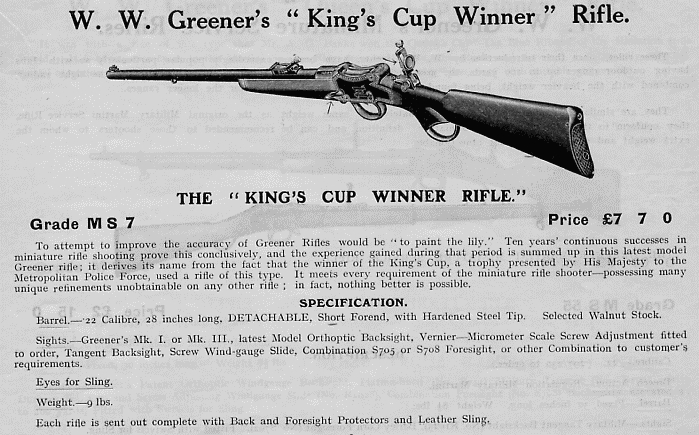 Middle: .22RF " Queen's Cup Winner" serial no. 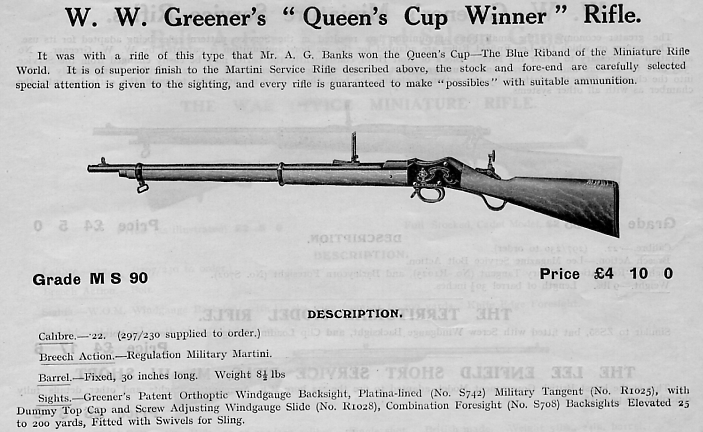 024450 brought out by Greener after A.G. Banks became the first winner of the Queen Alexandra Cup with a similar rifle in1907. The "QA" was then an individual competition, but is today for a County team of six. Bottom: .22RF W.W. Greener target rifle serial no. 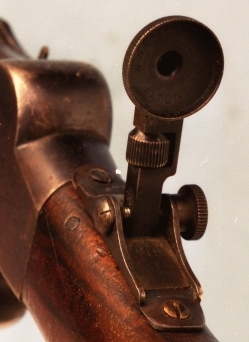 19289, fitted with BSA target fore-sight and Parker-Hale model 3A rear-sight. The barrel is detachable by means of a lever on the lHS for ease of cleaning and portability.. The cost of this rifle new was around seven guineas ( i.e. £7:7s:0d or nowadays £7.35 ) - Photo courtesy of L. King. Olympic history is full of hard-luck stories, but few can match the misfortune suffered by British marksman Philip Plater in the individual small-bore event in 1908. 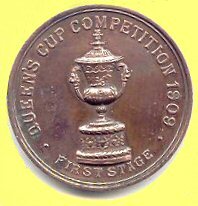 The conditions of the competition permitted twelve entries from each country but, as the entry forms for George Barnes, the nominee of the Twenty Two Club, went astray, Philip Plater was named as the twelfth British entry in his place. Shortly afterwards, the entry form for George Barnes arrived and, as the U.S.A. had been granted an extension to the closing date for entries, a similar facility was given to Great Britain and Barnes' entry was duly accepted. This meant, of course, that Britain had 13 official entries instead of the permitted twelve, but greater confusion was to follow. 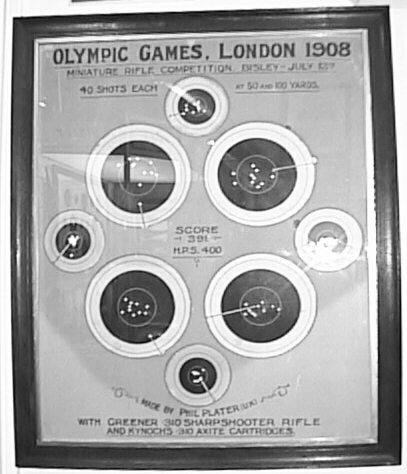 When the competition got underway, the British team officials lost count of the number of British marksmen who had shot in the competition. Thinking that only eleven men had already fired, Plater was called on although there was only half an hour to spare before the time limit for the competition expired. Plater ran to the firing-point and in varying light, a gusty wind and fine drizzle, he moved from mat to mat and fired his 80 rounds in less thn 30 minutes. In his 40 rounds from 50 yards, Plater fell only five points short of the maximum possible and at 100 yards he dropped only four points. His total of 391 points was a new World Record and, in the initial results list issued by the National Rifle Association, Philip Plater was shown as the winner of this competition and the Olympic Champion. It then transpired that the British team officials had made a major error and, at the time Plater shot, the permitted number of twelve British marksmen had already taken part. It took some days to decide whether the score of Plater or that of Barnes should be excised from the records and eventually George Barnes was declared the official British entrant. In October, Philip Plater was presented with a special gold medal and a record diploma by the British Olympic Council, but his amazing feat of marksmanship remains unrecorded in the official Olympic records. Those intrepid few shooting .310" Cadet rifles in the Service and Classic Classes in the Leagues ( and at the Imperial and Trafalgar Historic Arms Meetings ) will appreciate the achievement illustrated above at 50 and 100 yards. It must not be forgotten that the propellants and primer technology have much improved since the early Twentieth Century. Such diagrams would though, even now, be difficult to emulate at these ranges. Some of you have attained a significant mastery of their .310s. If anyone has an equivalent or better target and scores made recently, we would be pleased to show it here for comparison. ( See Recommended Reading ). folding rear aperture sight is fitted to the wrist. belies the quality of the sight itself. The S741 sold, in 1909, for 21/-, twenty-one shillings, ( £1.05), whilst the S744 could be obtained for barely over a third of that price at seven shillings and six-pence ( 37.5 pence post 1971). The S741 appears to have been available in more than one mark, with at least two editions having a vernier added to the elevation screw-thread. 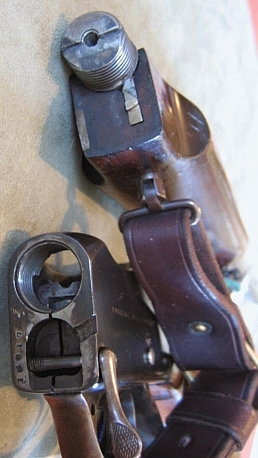 An image of this model is shown, below left, fitted to a .22RF Miniature Club rifle. Below right is an equivalent "Mark 1" sight advertised in the same catalogue, showing an hexagonal adjusting nut with calibrations 1 to 6 to assist the vernier adjustment.. 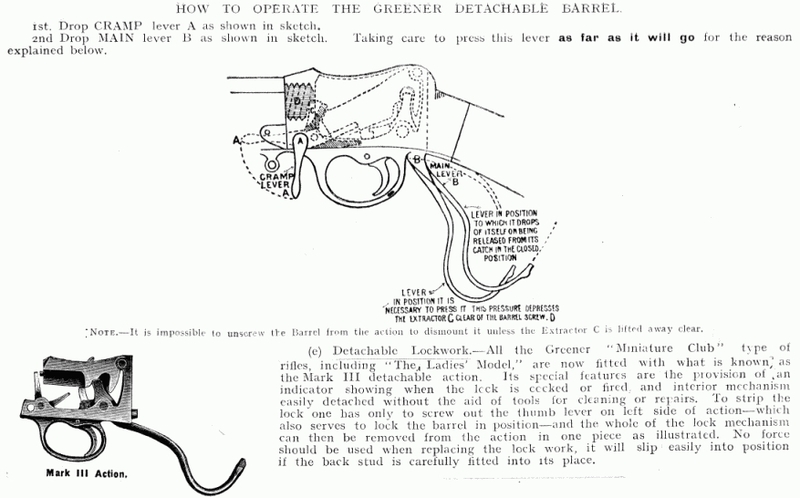 In that catalogue, Greeners devoted much of a page to comment and instruction on their folding aperture rear-sights. The picture of one of these associated with that page is of the economy S744 model already illustrated on a rifle above right. "APERTURE or ORTHOPTIC SIGHTS. . The modern aperture sight has to be an instrument of great precision since target shooting has now reached a stage of refinement, where the finest adjustments in the horizontal as well as the vertical plane are necessary to group all the shots in the central. The Greener Orthoptic sight can be fitted to all types of Martini and falling Block action rifles and is that most generally used. - It consists of a movable disc carried, on a stem of special design which travels laterally over a flat spring with double bearings. - The functions of this spring are to prevent shake in any position and keep the deflecting screw always up to its bearings. The spring (C) is marked with divisions corresponding with a 26 inch sight radius to three inches of adjustment per 100 yards, one complete turn of the adjusting screw B carries the sight over this interval, i.e., from one division mark to the next, besides these divisions, the nut or handle of this screw has six marks on its rim so that each of them represents half-an-inch per hundred yards of range. This method of marking is called the Micrometer system, and was first introduced by W. W Greener on Miniature rifles in his patent Windgauge tangent backsight. The same principle is applied to the elevating screw A, which has also six divisions, each giving adjustment of half-an-inch per hundred yards. The marks on both nuts are wide apart so that the very finest adjustments can be made with the greatest facility. 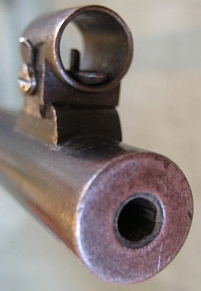 INSTRUCTIONS FOR USING THE GREENER ORTHOPTIC BACKSIGHT.-This sight folds down flat in the forward direction only, i.e., towards the muzzle of the rifle. The approximate ranges are marked on the left hand side of the stem. Each division on the screw A - represents one eighth-of-an-inch allowance on the target. at 25 yards, one quarter of an inch at 50 yards. and half an inch at 200 yards. The divisions on the screw B give the same allowance laterally either right or left according to the direction in which the sight is moved. The method of aiming with the aperture is exceedingly simple. The Shooter looks through the peephole in the same way as he would look through a ring or window, no effort should be made to centre the foresight in the aperture; the eye will automatically do this. The shooter should look at the bull or object aimed at and bring the foresight carefully into position underneath, or in the case of the ring foresight encircling the bull. Do not use the tangent backsight in conjunction with the orthoptic backsight. When ordering the orthoptic sight specify whether it is required for the Martini Service or for the Miniature Club pattern riffle. The divisions on the Greener Windgauge Tangent Backlight each represent half-an-inch allowance at 100 yards, one complete turn of the screw giving two and a half inches on the target at 100 yards. " "Despite the activities of the War Office and some of the big firms, the real boom of the civilian rifle movement did not come until a genius in the gun trade had discovered that it was possible to convert old Martini-Henry rifles to fire the .22 bullet. Who this genius was it is difficult at this date to say. To that well-known gunsmith, Mr. W. W. Greener, is usually given the credit for first showing that these old rifles could be fitted with new barrels, bored eccentrically so that the old striking-pin could be utilised for detonating the primer of the rim-fire cartridge. Once the idea had taken on, the conversion of Martini-Henry rifles went on apace. 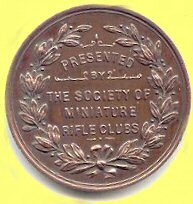 The Society of Miniature Rifle Clubs and the National Rifle Association secured from the War Office the right to convert these weapons and to sell them at 25s. to members of clubs affiliated to them. The converted Martini, as it was called, is the most excellent cheap rifle it is possible to obtain. It is of correct military weight in nine hundred and ninety-nine cases out of a thousand, and it shoots well enough to put ten shots in succession into a half- inch carton at twenty-five yards. It is not easily damaged, and, in fact, it fulfils all the ideals of a rifle club weapon. " 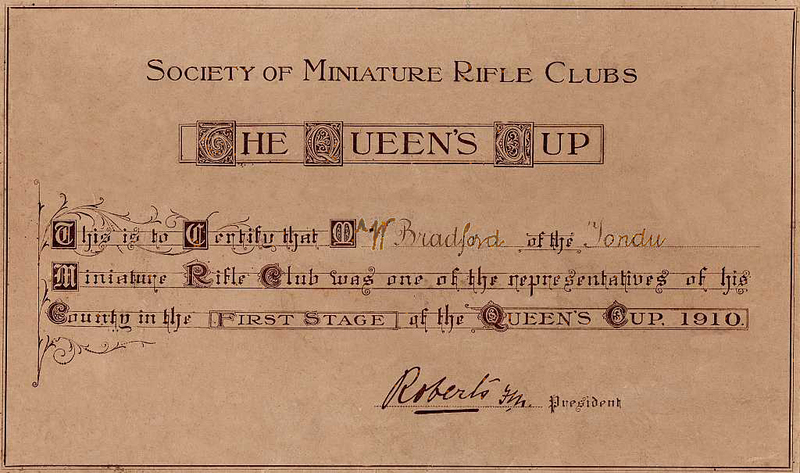 Below is a certificate issued by the Society of Miniature Rifle Clubs confirming the success of a Mr.Bradford in representing his County in the first stage of the 1910 Queen's Cup competition. The certificate is signed ( probably a printed signature ) by Lord Roberts who, as President of the S.M.R.C., was at this time still very much the leading promoter of the expansion of rifle shooting within the populace. was one of the representatives of his County in the first stage of the Queen’s Cup 1910." In the first stage of the 1910 competition he finished in 7th. place amongst the Glamorgan shooters - the first 6 making up the Glamorgan team for the next stage. Those who shot and didn't make the team received a certificate - the six in the team would have been awarded bronze medals. It is believed that just over 400 bronze medals were earned in 1910, but over 700 certificates would have been issued - very few Queen Alexandra's prize certificates seem to have survived to today. Glamorgan's 1910 story is not a happy one. The team of 6 then went on in the County Stage to record the highest score of all the counties participating, but in the final were disqualified for an unspecified reason, the only team ever to have been so in the history of the QA competition. ( This last information is courtesy of Brian Woodall, current Editor of the National Small-bore Rifle Association's journal " The Rifleman". an extract from "Random Notes on Rifle Shooting" by A.G. Banks, author of " A.G's. Book of the Rifle". as published in "The Rifleman" in February of that year. Below is an example of the Martini Henry rifle converted by W.W. Greener for the use of, and sale by, The British National Rifle association. In 1898, the rifle was converted to .303 calibre as a Martini Enfield Artillery Carbine I.
were intended for possible export. of the sight bed to the graduations for the full-bore round. 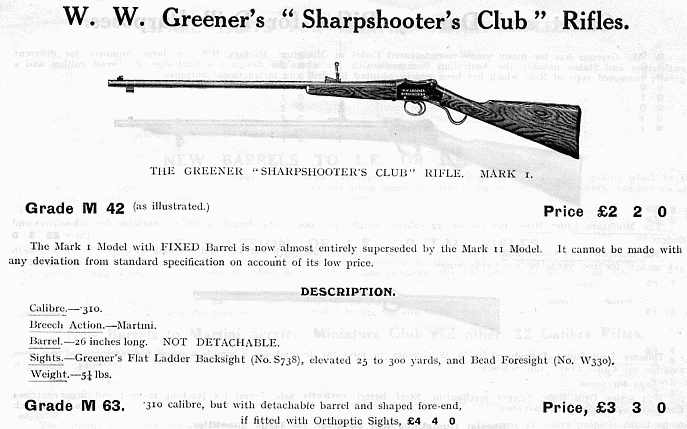 Greeners also produced "Take-down" versions of both their Martin-Henry converted rifles and their specially built small-frame Martinin sporting and TARGET RIFLES . These cleverly and quickly disassembled for easy transportation in a shotgun style case. 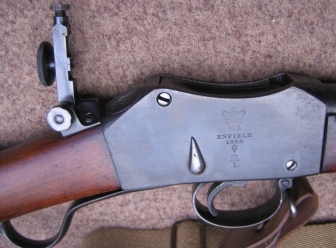 This particular rifle has been later fitted with the BSA Model No.8 folding rear-sight of the appropriate height. The action body was split at its base where the barrel thread screws in. 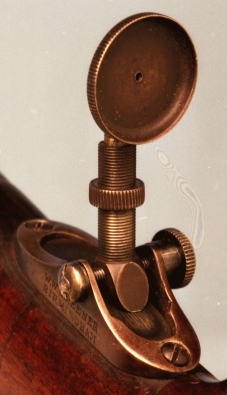 The clamping thumb screw tightens the body onto the thread, locking the barrel firmly and accurately and locating on the lugs visible in the image below. The proof of the pudding is in the eating. This rifle is still remarkably accurate, probably grouping within a half inch at 50 yards. This system was used by Greener on large numbers of his small-bore rifles; both the conversions and his many purpose-built "Miniature Club" style rifles. It is incredibly reliable and not prone to significant wear problems. The flip over fore-sight with blade and ring elements - the ring can be seen folded forward in the tunnel. .................. gave instructions for the correct use of their "Take-Down" system. The BSA Company manufactured their own takedown version of the Model No.6 sporting and target rifle. 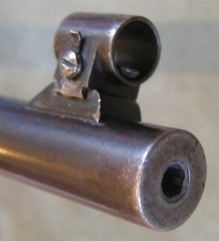 This system did not use a split clamping action body, but a simple "cotter" style locking pin through the action body and a semi-circular machined groove in the underside of the barrel breeching thread. 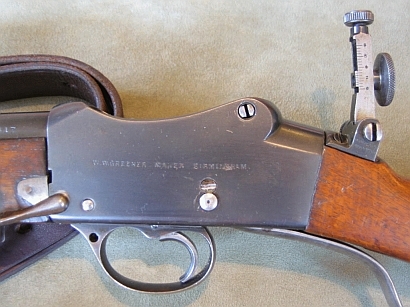 When the Model 12 BSA rifle later appeared on the market, that was indeed offered with a "take-down" option, but this time with a similar split receiver design to that of Greener. Whether any patent issues were here involved is presently not known. A contemporary piece covering the subject of miniature-calibre cartridges was written by this well-known gunsmith, it is well worth taking the time to read it - " Greener on Ammunition ". may be viewed as a PDF file by clicking the image below which links to our Catalogues Page.